The first option is to travel from Hat Yai to Hat Yao Pier near Trang and catch the 13.00 Tigerline Ferry to Saladan Pier in Koh Lanta. The journey by road from Hat Yai to Hat Yao Pier is 205 km and takes slightly over 3 hours. The ferry journey from Hat Yao Pier to Koh Lanta takes 1 hour 30 minutes. The second option is to travel further north by road to Hua Hin Pier which is 263 km from Hat Yai, which if you drive non-stop takes 3 hours 41 minutes. From Hua Hin Pier the sea crossing over to Klong Mak Pier on Koh Lanta’s North Island takes 10 minutes. The car ferry runs daily from 06.00 to 22.00. From Klong Mak Pier it’s a 7.8 km journey by road to Koh Lanta Yai where all the resorts and other facilities are located. The quickest and simplest way to travel from Hat Yai to Koh Lanta is to book one of the direct minivan services leaving from the city centre which travels direct to Koh Lanta’s South Island via Hua Hin Pier. Jolly Travel operates a daily service which you can book online using the Search Box below. The Jolly Travel service departs from Hat Yai City Centre. The Jolly Travel service includes a minivan transfer from Klong Mak Pier to most resorts, hotels and guesthouses in Koh Lanta. Instant Ticket Confirmation: After booking you will be sent an electronic voucher by e-mail. Check In: Bring a print out of your booking voucher when you check in for your journey to Koh Lanta. The Jolly Travel service to Koh Lanta departs from in front of the Red Planet hotel in Hat Yai, which is a 500 metre walk from Hat Yai train station and 2.7 km from Hat Yai Bus Station. The minivan service travels to Hua Hin Pier via Krabi Town where passengers change minivan for the final part of the journey to the car ferry pier. This is a slightly indirect route which adds about an hour to the journey time. On arrival at Koh Lanta’s Klong Mak Pier passengers with the Jolly Travel service are taken by minivan over the road bridge to Koh Lanta Yai. Drop off at a resort, hotel, guesthouse or other location on Koh Lanta is included in the ticket price. You can ask to be dropped off at any point except for Kan Tiang beach, Klong Jark beach and Bamboo beach which are not easily accessible by road. 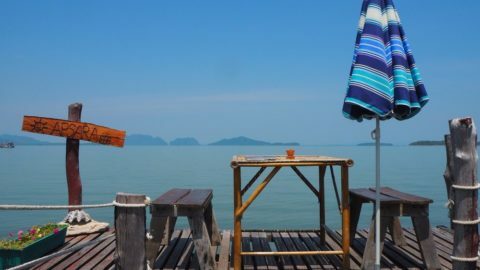 If you do want to go to Kan Tiang beach, Klong Jark beach or Bamboo beach explain this to the Jolly Travel staff at check-in and they will arrange for you to be dropped off somewhere you can find someone to take you there. Jolly Travel to Koh Lanta leaves from the Red Planet Hotel Hat Yai on 152-156 Niphat Uthit 2 Road. The car ferry to Koh Lanta departs from Hua Hin Pier.